Archive for the ‘selenium’ Category. A lot has changed since my last post using Selenium to test web pages. Then you had to install a few things both on the client, browser and server. Today it has been simplified a lot. All you need really is the webdriver and you are in business. You can use the webdriver on your development machine and the server machine as well to run the Selenium tests. In my case I’m using the Ghost-PhanthomJS webdriver as I need to do headless testing ( no GUI ). Since it’s a lot harder to run tests automatically on the server if there is need for GUI, it will complicate things a lot, has to do with security restrictions etc. Lets take a look at what is needed. Install xUnit Package Manger Console in VS using nuget. Note I’m specifically using 1.9.2 and 2.0 as I know these two work on the build machine, I had trouble with other version combinations. 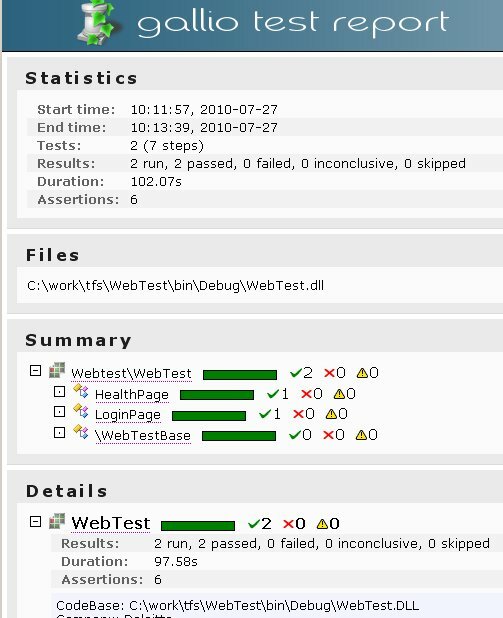 Then we write the test that will run after the build does the web deployment to the local server. The sample below just loads google.com and checks for the title, then shuts down. If you are using TFS you also need to point your build agent to the xUnit runner, in my case I just check it in as part of the project and set it like that. That’s all you need, then you can write your own tests to test specific functionality tailored to your needs. Selenium is pretty powerful for Integration testing. I just setup browser testing framework utilizing Selenium from TeamCity project. The usual suspects are involved, Gallio, MBUnit, Nant and even C# Unittests. The usual scenario when it comes to automating browser testing is that the QA / testers will create some scripts to run a browser against your website. Somehow those tests are usually not maintained very well and often are run by hand. There is not much value in browser testing scripts if you have to run them by hand. As I needed browser testing on one of the projects I’m on I decided to look into using more of a automated setup to run the browser tests. There seem to be two big players Waitn and Selenium, Selenium lends itself to broader range of testing, naturally we will go with Selenium. Here is the scenario I want, the tester installs a recorder on his computer, in this case a FireFox plugin. The tester records the tests and runs them in the browser using the plugin tool. Once the tester is happy with the tests the tester checks them into the repository. After check-in tester lets a developer know that there are new or changed tests. The developer takes the script and turns it into C# UnitTest, simply has Selenium convert it to UnitTest code. Then the developer takes and updates or adds the tests that resulted from the scripts and checks it into the repository. The conversion step could be automated in the future once Selenium supports that. The next step is to run it from TeamCity and after it runs you get email with the results. So let’s take a closer look at what is needed. We need the UnitTest to be able to run against different servers using different browsers. We will pass values from TeamCity to the Nant script that is responsible for compiling and running the tests. This is how your test C# configuration file might look like. Then the base test class will look something like this. After the Nant script compiles the tests and is getting ready to run the UnitTests it needs to startup the Selenium engine. Make sure to spawn in order for the Selenium engine to exist on another thread than your tests. In order to run the tests using different browsers, change the configuration file of the tests before run. As I had a need to setup different configurations in TeamCity to run against different locations on the webserver I used a couple of Nant variables that are passed on the command line from TeamCity, like you normally would do when running Nant script -D:BaseUrlPath=/Test/ etc. With this setup once we deploy to a server we can run all the browser tests on it using different browsers with one click of a button from TeamCity.